The Real Pius XII , by William Doino, Jr. First Things "On The Square" August 2, 2011. Documents Reveal Pius XII Saved 11,000 Roman Jews, Pave the Way Foundation Announces Findings Zenit. July 22, 2011. Man Recalls how Pius XII Hid Jews in the Vatican: Says Nazis Planned to Annihilate Catholics Next Zenit. November 2, 2010. Pius XII ‘secured visas for Jews’ after Kristallnacht Catholic Herald UK. July 7, 2010. Pius XII's Efforts to Save Jewish Culture Revealed, Mobilized Church Leaders to Defend Synagogues. The recently opened sections of the Vatican Secret Archives have revealed that Pope Pius XII not only helped save thousands of Jews, but also their patrimony, from the Nazis. Zenit. July 1, 2010. Personal Memories of Pius XII: Interview With Sister Margherita Marchione Zenit. June 7, 2010. How a Strategy of "Silence" Saved Thousands of Jews: Documents and Testimonies Point to Pius XII's Efforts Zenit News. May 25, 2010. Catholics and Jews Renew Dialogue on Pius XII, Affirm Solidarity With Benedict XVI. Zenit News. April 29, 2010. Archives Director: Pius XII Files Ready in 5 Years: Says No Mysteries or Surprises Expected Zenit News. March 2, 2010. Vatican to Put Wartime Archives Online CBS News. February 16, 2010. Incorrect Date on Pius XII Document Explains Silence - Pope Couldn't Be Indifferent to Raid as It Hadn't Happened Yet, by Jesús Colina. February 2, 2010. Pius XII Defended in Israeli Newspaper: American Scholar Says Defamation is "Doomed to Failure" Zenit. February 1, 2010. Nothing Novel Seen in New Pius XII Documents L'Osservatore Romano Gives Context of Two Texts From 40s. Zenit. February 1, 2010. Priest Gives Proof of Pius XII's Aid to Jews: Gives Testimony of Pope's Anti-Nazi Actions Zenit. January 14, 2010. Pius XII did help the Jews, by William Doino Jr. January 4, 2010 (Times UK) "The historical evidence that the wartime pontiff gave orders for Rome's convents and monasteries to take in Jews fleeing the Nazis"
Friend to the Jews, by Gary L. Krupp. New York Post December 28, 2009. Vatican Statement on the Venerable Pius XII Here is a translation of a statement from Vatican spokesman Father Federico Lombardi regarding Saturday's recognition of the heroic virtue of Pope Pius XII. December 23, 2009. Hebrew-Speaking Catholics Affirm Pius XII's Virtues: Say Only God Can Know if He Did Enough to Save Jews Zenit. December 21, 2009. Rabbi calls charge Pope Pius was Nazi collaborator 'false, malicious', by Peter Finney Jr. Catholic News Service November 11, 2009. Pius XII's War Efforts Seen on Rediscovered Films - The aid Pope Pius XII offered during World War II on behalf of all victims, regardless of their religion, is documented on newly rediscovered films. Zenit October 29, 2009. Defending Pius XII; A Pope for All Priests: "Fighting Nun" Publishes New Book on Wartime Pontiff Zenit. June 18, 2009. Italian newspaper reveals details behind Hitler’s plan to kill Pius XII Catholic News Agency. June 17, 2009. More Proof of Hitler's Plan to Kill Pius XII: Son of German Intelligence Officer Comes Forward Zenit News. June 16, 2009.
Who Brought Down Pius XII? - L'Osservatore Director Blames Communists, Church Division Zenit. June 15, 2009. New Evidence Says Pius XII Helped Jews: Foundation to Publish 2,300 Pages of Documents Zenit. June 15, 2009. Pius XII. A Book and an Essay Shed Light on the Black Legend, by Sandro Magister. (Chiesa). "The image of Pacelli as "Hitler's pope" is contested by a growing number of scholars. There were many responsible for creating this image, including Catholics. But Soviet propaganda was decisive. A Jesuit historian reveals the strategy." Israeli, Vatican historians meet to discuss wartime pope Ha'aretz March 9, 2009. Vatican document shows Pius XII saved Jews JTA March 5, 2009. Documents show Pius saved Jews from Nazis, by Ed West. The Catholic Herald February 27, 2009. Group Gives New Proof of Pius XII's Help for Jews: Says Pope Worked to Save Lives Before, During, After War Zenit News. February 20, 2009. Pope Pius XII: The Case For - and Against -Canonization The Jewish Ledger November 25, 2008. Jews, Catholics Want Calm on Pius XII Issue: Joint Statement Urges Mutual Respect Zenit News Agency. November 14, 2008. Fifty Years After the Death of Pope Pius XII: "Pro Pope Pius" introduction written by the Secretary of State of His Holiness for the book by Sister Margherita Marchione, gathering the nun’s research in defence of the memory of Pope Pacelli. Pius XII an 'exceptional gift to the church,' Benedict says, by John Allen Jr. (Daily Blog) National Catholic Reporter Nov 8, 2008. Pius XII Display Includes Rabbi Thank You: '44 Letter Recalls Jews Saved in Rome Zenit News Service. November 5, 2008. A full-court press from Benedict XVI in defense of Pius XII, by John Allen, Jr. National Catholic Reporter October 9, 2008. Pius XII 'spared no effort' for Jews, Benedict XVI says by John Allen Jr. National Catholic Reporter September 18, 2008. American Jew comes to the defense of Pius XII, by John Allen Jr. National Catholic Reporter September 17, 2008. Vatican demands opening of Israeli archives AFP. June 17, 2008 - A Vatican representative on Tuesday expressed regret that some 15 Israeli archives do not allow access to documents relating to Pope Pius XII and his attitude during the Holocaust. Holocaust survivors announce symposium on Pius XII’s work to save Jews during WWII Catholic News Agency. June 19, 2008. Future Pope Pius XII opposed anti-Semitic legislation in Poland Catholic World News. June 3, 2008. E Pio XII arruolò l’ebreo per salvarlo dai nazisti, by Andrea Tornielli. Il Giornale. November 15, 2007. Pius XII entlisted a Jew to save him from the Nazis - translation by Fr. John Zuhlsdorf. Pope Pius XII: "Be proud to be a Jew!" Inside the Vatican October 25, 2006. Careful scholar takes fresh look at Pius XII, by Eugene Kennedy. National Catholic Reporter, October 6, 2000. Top Vatican official: Documents show Pius XII worked to help Jews Catholic News Service. June 5, 2007. New book details Hitler plot to kidnap pope, foiled by Nazi general by Nancy Frazier O'Brien. Catholic News Service. June 1, 2007. Book Shows Pius XII Wasn't Silent Zenit News Service. May 22, 2007. On "Pio XII, Un Uomo Sul Trono di Pietro" (Pius XII: A Man on the Throne of Peter), by Andrea Tornielli. The Encyclical That Infuriated Hitler: Jesuit Says Pius XI's Document Was Prophetic Zenit. April 4, 2007. More Evidence Pius XII Was Not Hitler's Pope According to the newly discovered documents, Pius XII was considered an enemy of the Third Reich. Zenit. April 2, 2007. Father Gumpel Urges Prudence Over Defector's Tale [of KGB infiltration and defaming of Pius XII Zenit News Service February 18, 2007. KGB intent on linking Pius XII with Nazis, says former spy Catholic News Service. January 26, 2007. Moscow’s Assault on the Vatican: The KGB made corrupting the Church a priority, by Ion Mihai Pacepa. National Review January 25, 2007. [Asserting that the powerful play attacking Pope Pius XII, entitled The Deputy, was itself produced by the KGB as an effort to discredit Pope Pius XII]. Pope Pius XII: "Be proud to be a Jew! ", by William Doino. Inside the Vatican October 2006. Historian: Documents show role of future wartime pope in Vatican's pre-WWII anti-Nazi stance International Herald Tribune / AP. Sept. 20, 2006. Diary Shows Pope's Opposition to Hitler , by Frances De'Emilio. Associated Press Sept. 19, 2006. Foundation Hails Myth-Debunking Book on Pius XII Zenit News Service. August 29, 2006. Pius XII hid Jews during war, by Philip Crispin. The Tablet August 19, 2006. Cardinal Kasper defends Pius XII Catholic World News. July 19, 2006. Pius' Children, by Dimitri Cavalli. The American April 2006. Pius XII considered resigning to thwart Nazis Catholic World News. April 13, 2006. The Black Legend of Pius XII Was Invented by a Catholic: Mounier, by Sandro Magister. www.chiesa. June 20, 2005. Nuncio's Writings Tell of No Controversy Over Jewish Children. Interview With Journalist Andrea Tornielli. Zenit.org. January 25, 2005. Hitler plot to kidnap the pope revealed, by John Hooper. The Guardian January 17, 2005. Theologian Calls Latest Pius XII Controversy "Artificial". Zenit.org interview with Cardinal Georges Cottier, theologian of the Pontifical Household. January 13, 2005. "1946 Document on Jewish Children Tells a Different Story, Undercuts Tale That Vatican Tried to Keep Them From Their Families" Zenit.org. Jan 12, 2005. Vatican hit by new row over war role: Pope kept Jewish families apart, by John Hooper. The Guardian Dec. 29, 2004. Pius XII Clearly Assailed Nazism, Says Researcher: Didn't Remain Silent, Contends William Doino. Zenit.org. Dec. 23, 2004. On Pius XII's Help to Slovakian Jews Interview With Monsignor Walter Brandmuller. Zenit.org. Sept. 8, 2004. Praise for a U.S. Diplomat's Memoirs on Pius XII Zenit.org. June 17, 2004. Vatican Told Nuncio to Forgo Praise of Hitler. Professor Sees Signs of Opposition to Nazism in 1930s Archives. Zenit.Org. May 1, 2003. Lutherans on board for Pius XII smear reversal . Catholic News Service. April 4, 2003. Letter reveals Edith Stein asked Pope Pius XI to condemn Nazism. Feb. 21, 2003. Historian Sir Martin Gilbert Defends Pius XII, Zenit.org. Feb. 20, 2003. Stein letter emerges from Vatican archives CNN. Feb. 19, 2003. Pius XII Gave Instructions Specifically to Save and Protect Jews. Magazine to Publish 2 Wartime Letters. Zenit.Org Jan. 29, 2003. Vatican to Release Some WW II Archival Material Early. America. March 4, 2002. Rome to open some prewar papal archives, Christian Century Feb. 27, 2002. Vatican to open secret archives on Germany up until 1939. Zenit.Org. February 16, 2002. Continuing Archival Controversy. America, August 13, 2001. Declaration by Pius XII "Relator" on Historians Panel, by Fr. Peter Gumpel. L'Osservatore Romano Weekly Edition in English. 1 August 2001, page 3. Historians suspend study of Vatican archives. National Catholic Reporter, August 10, 2001. Letter: U.S. knew of Jewish deaths in 1944. Christian Century. Nov. 15, 2000. Scholars Say Vatican's Published Material on Holocaust Inadequate. America. Nov. 11, 2000. Preliminary Report: the Vatican and the Holocaust. International Catholic-Jewish Historical Commission. Catholic News Service. Nov. 9, 2000. New Studies Document Pius XII's Opposition to Nazism, ZENIT News Agency. 15-Mar-2000. Scholars to study Vatican war archives. Christian Century. Dec. 15, 1999. Interfaith team to study archives. The Christian Century. Nov. 3, 1999. Pius XII's Beatification on Schedule. America. Oct. 30, 1999. Vatican historian comes to Pius XII's defense. National Catholic Reporter, Oct. 22, 1999. Rabbi's Condemnation of Pope Pius XII Criticized. America. June 5, 1999. Attacks on Pius XII Said to Sour Catholic-Jewish Relations. America, April 10, 1999. Vatican official criticizes Jews, by John Allen, Jr. National Catholic Reporter. Dec. 11, 1998. Israel urges delay on pope's sainthood cause, by Teresa Malcolm. National Catholic Reporter. Nov. 13, 1998. Delay beatification [of Croatian Cardinal Alojzije Stepinac], , Jewish group asks. National Catholic Reporter, Oct. 9, 1998. Statement on Holocaust criticized for not faulting silence of church officials. National Catholic Reporter. March 27, 1998. Pius XII: Hated or Revered by the Third Reich? An interview with historian Pier Luigi Guiducci about his new book on the war-time pope. Alberto Carosa. The Catholic World Report June 20, 2013. Kevin Madigan’s Offenses Against History, by William Doino Jr. (a rebuttal of Kevin Madigan's article, "How the Catholic Church Sheltered Nazi War Criminals" Commentary December 2011). Pius XII and the Distorting Ellipsis Ronald J. Rychlak and William Doino, Jr. First Things "On The Square" September 15, 2010. Pius XII and the Holocaust: A Reader. Published by the Catholic League. A Question of Judgment: Pius XII & the Jews, by Dr. Joseph L. Lichten - former director of the International Affairs Department for the Anti-Defamation League of B'nai B'rith, in response to the play The Deputy by Rolf Hochhuth. Is now the time to beatify and canonize Pope Pius XII?, by John Allen, Jr. National Catholic Reporter June 8, 2007. The Good Samaritan: Jewish Praise For Pope Pius XII. Inside the Vatican, p. 72-77. Oct. 2000. The Record of Pius XII's Opposition to Hitler. Inside the Vatican. Oct. 1999. The Myth in Light of the Archives: The Recurring Accusations against Pius XII, by Pierre Blet, S.J. The Righteous Heroes of the Holocaust - address given by Lisa Palmieri-Billig, liaison of the American-Jewish Committee to the Holy See, and Rome correspondent for the Jerusalem Post, on the occasion of the presentation of the Italian translation of Martin Gilbert's book, "The Righteous: The Unsung Heroes of the Holocaust." January 24, 2007. British Historian Defends Pius XII - Sir Martin Gilbert's "I Giusti, gli eroi sconosciuti dell’Olocausto" documents the action of the Church and Pope Pius XII in rescuing Jews from Nazi persecution. January 29, 2007. A Son of the Church of Pius XII Breaks the Silence on His Sanctity, by Sandro Magister. www.Chiesa. January 27, 2005. When Rome's Religious Houses Saved Jews. Interview With Historian Sister Grazia Loparco. Zenit.org. January 21, 2005. The End of the Pius Wars, by Joseph Bottum. First Things 142 (April 2004): 18-25. Pius XII and the Jews: The War Years, as reported by the New York Times, by Stephen M. DiGiovanni, H.E.D. Catholic Social Scientist Review Vol. VI, 2001. "Most Of Rome's Jews Were Saved From Hitler's 'Final Solution'" L'Osservatore Romano (Vatican, January 24, 2001). Translation of an interview that Mr. Nikolaus Kunkel, a witness to Pius XII’s actions to save Roman Jews during the Second World War, gave to the German Catholic News Agency (KNA) on November 7, 2000. Pius XII as Scapegoat, by Michael Novak. First Things 105 (August/September 2000): 20-22. "800,000 Saved by Pius XII's `Silence'", by Donald DeMarco. Catholic Register May 18, 1998. - The 1963 play, "The Deputy" by Rolf Hochhuth, which presents Pope Pius XII’s silence during the holocaust as criminal, inhuman and cowardly, almost certainly generated the largest controversy in the history of drama. Pius XII and the Jews: Greatness dishonored, by Stephen Boyle. Homiletic & Pastoral Review, April 1999. pp. 26-32. Response to Accusations Against Pius XII: Myth vs. Historical Fact, by Father Pierre Blet, S.J. L'Osservatore Romano, April 29, 1998. pp. 16-19. Blaming the wartime pope, by Kenneth L. Woodward. Newsweek, March 30, 1998. Pope Pius XII and the Jews, by Sr. Margherita Marchione, Ph.D. Crisis Magazine, 15, no. 1 (January 1997): 20-23. Pius XII's Massive Crusade [Part I]; Part II. Interview With Sister Margherita Marchione. Zenit News Service Oct. 6/8, 2006. Pope Pius XII, by Margherita Marchione. Homiletic & Pastoral Review, July 2001. Pope Pius XII: He Was Indeed “Just Among the Nations”, by Sr. Margherita Marchione. CatholicExchange June 15, 2006. Rabbi Says Pius XII Deserves "Righteous" Title Interview with Rabbi David Dalin. Zenit News Service. January 17, 2006. The Righteous Pope, by David G. Dalin. Traces April 2001. Pius XII and the Jews", by Rabbi David D. Dalin. Weekly Standard vol. 6 no. 23 (February 26, 2001). Scholar Ronald Rychlak Defends Wartime Pope Zenit News Service. January 11, 2006. Postwar Catholics, Jewish Children, and a Rush to Judgment, by Ronald J. Rychlak. BeliefNet.com. January 19, 2005. "Goldhagen v. Pius XII", by Ronald J. Rychlak. First Things 124 (June/July 2002): 37-54. 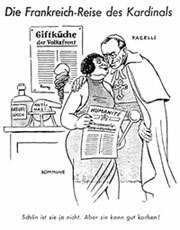 A 1937 S.S. cartoon mocking the future Pius XII as a supporter of Jews and anti-Nazis. The caption reads: "She's not too pretty. But she cooks well!"